Railways of the World. "Alaska's Sawtooth Range, Whitehorse to Skagway.." More-> . 28th July 2008 - Malta-based hotel operator CHI Hotels & Resorts (formerly Corinthia Hotels International) signed a 20-year agreement with Vermont Developments of UK to manage and operate 66 apartments at the third phase of Vermont's £100m Liverpool waterfront scheme, Sefton Street: The Quarter, under the Ramada Plaza brand tier. CHI Hotels & Resorts (CHI), the European joint venture partner of hotel giant Wyndham Hotel Group (NYSE: WYN), owners of the Ramada brand, will operate the units as apartment-suites alongside the four-star Ramada Plaza hotel already being built at the site. 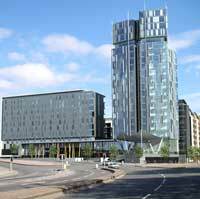 The units are located in The Tower element of the scheme, a graceful 22-storey glazed building. The Vermont's scheme, located at the junction of Sefton Street and Parliament Street, has already established a reputation for defying the residential market slowdown - 83 per cent of the 187 first phase apartments have been sold. Mark Connor, chief executive of Vermont Developments, said: "We are obviously delighted to have achieved another positive milestone for The Quarter. It is a tough market but we believe in the quality of our scheme. Given the challenging residential sales market, achieving an agreement to operate these units on a serviced basis is obviously welcome news and a testament to our vision for The Quarter, and also the confidence shared by our hotel operator." "Taken together, the 66 apartments and the 173-room hotel will create a unique offer in the marketplace and will establish Liverpool as a key destination for the Ramada Plaza hotel tier. 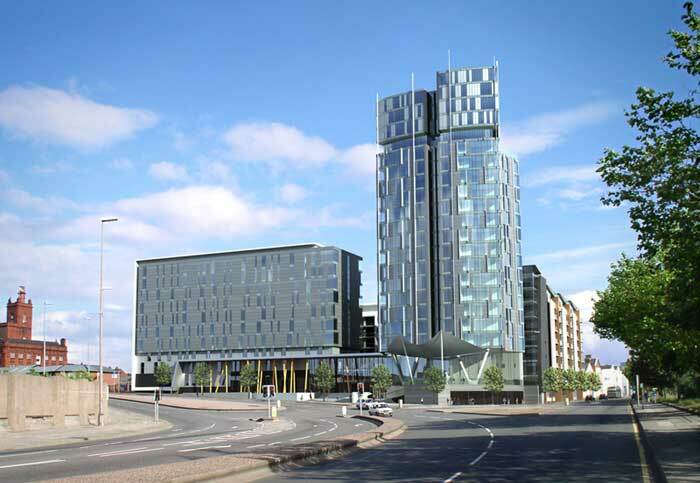 This is the highest quality tier of the Ramada brand, aimed at corporate and high end leisure customers and given the position of our scheme, adjacent to the new Liverpool Arena and Conference Centre, The Quarter represents a good fit for the city." "This latest deal with Vermont Developments helps solidify an already excellent business relationship between our two companies" commented CHI Vice President - Development Paul Pisani. "Together with the hotel rooms, the 66 additional serviced apartment-suites will increase our marketing options immensely. This entire project will no doubt also generate increased awareness of CHI in the UK as a leading hotel operator that already exclusively manages the luxury Corinthia Hotels brand worldwide and the Wyndham and Ramada brands in Europe, Africa and the Middle East." The Quarter, which is a joint venture between Vermont Developments and Ethel Austin Properties, is one of Liverpool's most eagerly anticipated new destination developments. The mixed-use scheme will form a dramatic southern gateway into Liverpool city centre, featuring a graceful 22-storey residential tower, office accommodation, retail and leisure space and a new public square. Vermont Developments has also confirmed that it has put on hold plans to commence its £40m mixed-scheme at Adelphi Street in Salford in the short term. The proposed scheme features 221 residential units. "It makes sense for us to reconsider our proposals and timescales for the project until such time as there is more certainty in the residential and mortgage markets," said Mark Connor. Issued by the Communications Department of CHI Hotels and Resorts on 28th July 2008.